Barometer (Definition): An instrument that measures how things are changing or likely to develop. Imagine being able to use your Demo Account to guide trade decisions in your Live Account. MT4 Sidekick is a new and innovative tool that uses a Demo Account to create a database of trade results that is shared with a Live Account. When a strategy (EA) in a Live Account receives a trade signal it checks the database to determine how that strategy is currently performing in the Demo Account. If the strategy is currently performing well in the Demo Account then a new position is opened in the Live Account -- otherwise, the signal is ignored. The idea is very simple, two accounts -- Demo and Live -- running the same portfolios and strategies. The strategies in the Demo Account are allowed to trade with no restrictions and are used to create and update an active, shared database of trading results. When a strategy in a Live Account receives a signal it checks the database before opening a new position. In this way a Live Account can use the Demo Account as a barometer to determine how a strategy is performing in the current market. The availability of a barometer that measures current performance and which can be accessed before a position is opened is a powerful technique. A strategy's performance will vary depending on patterns that occur in the current, incoming data -- and the incoming data is always changing. So, taking advantage of a Demo Account in this way -- i.e. as a "barometer" -- opens up a new way of managing EAs and trades that can be used to your advantage to provide a real "edge". You could even use a live "micro" account in place of the Demo Account, in which case the barometer would be even more accurate. MT4 Sidekick is different than other Forex software in that it uses a Demo (or micro) Account as a barometer of how your strategies are trading NOW. It is not interested in how a strategy performed last week, last month, last year or ten years ago. If a strategy makes it into your portfolio it means its back testing statistics were good enough using some data source over some data horizon. So, you've already done that work. The moment a strategy is added to a Live Account then all that matters is Wins and Losses (with few exceptions). That is, statistics are most useful when generating / training new strategies and deciding which ones to include in a portfolio EA. But once you begin trading we really only care about Wins and Losses. Because market conditions change, then patterns in the current data will also change -- and a strategy's performance is reflected by how well it recognizes patterns in the current data stream. This is where a barometer becomes most useful -- it can help us deduce how well a strategy recognizes patterns under current market conditions. High-quality strategies generated / trained by FSB-Pro. Using MT4 Sidekick is not a substitute for creating good strategies -- that should still be the #1 priority. High-quality strategies are ones with excellent back testing statistics and Win / Loss percent in the high 80% (or higher). Confidence in your broker's Demo Account. That is, you've determined your strategies and portfolio EAs perform similarly in Demo and Live accounts. Portfolio Maker is used to combine individual FSB-Pro strategies into a portfolio EA. 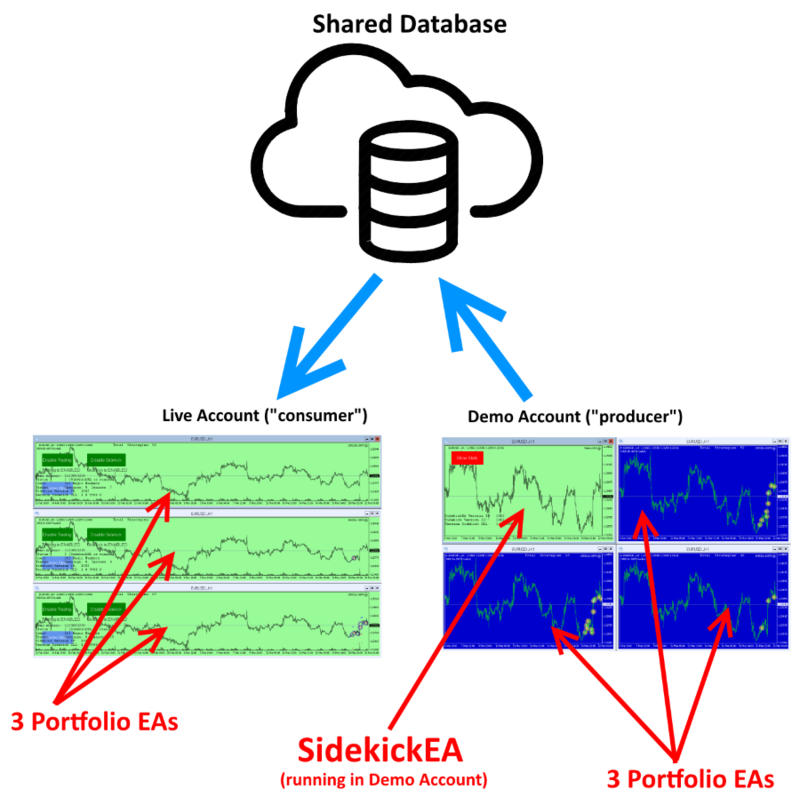 Portfolio Maker is required because it inserts code into the portfolio EA that knows how to access MT4 Sidekick's shared database. MT4 Sidekick is an inexpensive tool -- only $49 USD. The 'Buy Now' button below will take you to a secure checkout. When the transaction completes a message will be sent to your email address with download instructions and a license key. After installing the application, the first time you launch the program it will prompt for the license key. The license key is stored on your machine so that subsequent launches will not require that you again input the license key. Here is a link to documentation and instructions for using MT4 Sidekick.